Do you know what I love? Triangles, color-blocking, primary colors... oh yeah, and you guys!! Because I love all of these things, and it's almost Valentine's Day, I thought I'd make a heart crochet block to share with you! 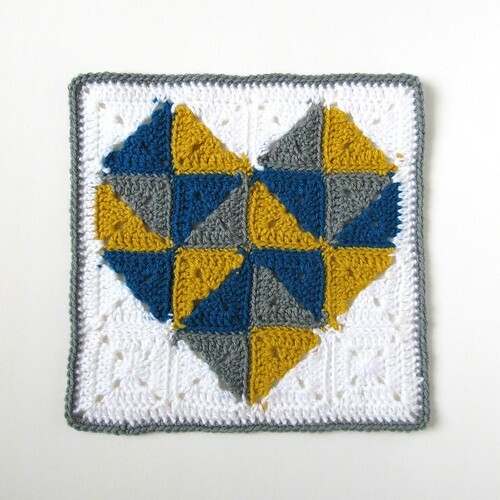 I've also made this block to join in Claire's, from Far From Harm Farm (one of my favorite blogs, so you should check it out! ), Making Winter 2013. I don't know about you guys, but here winter has made a bit of a resurgence, so making this block has made my winter a little brighter and happier, especially since I've made it to show you all how much I love you taking the time to read and comment on my blog! I love you guys!! Round 2- Ch 3, dc in next two stitches, (2 dc, ch 2, 2 dc) in corner space, *dc in next 3 stitches, (2 dc, ch 2, 2 dc) in corner space, repeat from * twice, sl st to top of ch 3, fasten off. 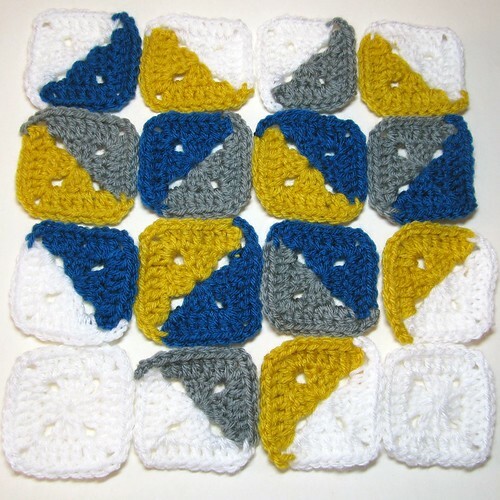 Here's your finished solid background square (make two, one for each bottom corner of the block). With first color, start with magic ring. 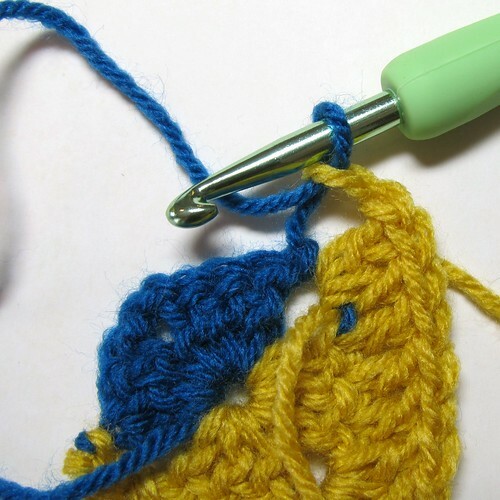 2 dc in same corner space, 1 dc in next 3 stitches, (2 dc, ch 2, 2 dc) in corner space, 1 dc in next 3 stitches, in corner space- 2 dc, ch 2, sl st to top of ch 3, fasten off (both colors). 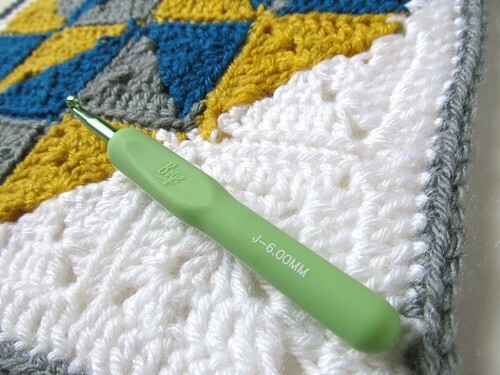 Finish all 16 of your squares, and sew in those pesky ends! 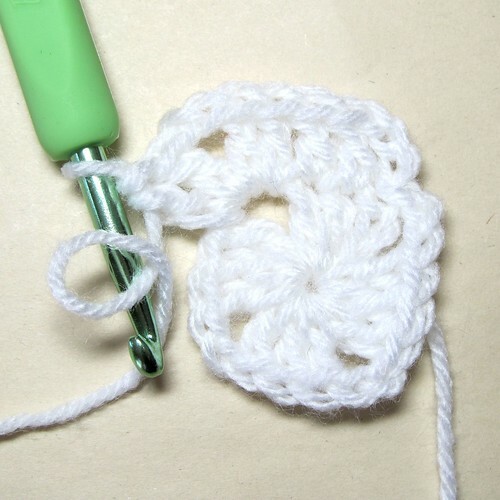 *Leave last loop of both double crochets on hook, yarn over, and work off all three loops at once. 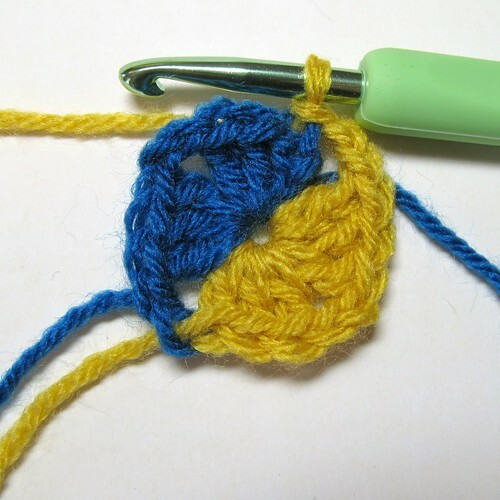 Finish with a border of single crochet. 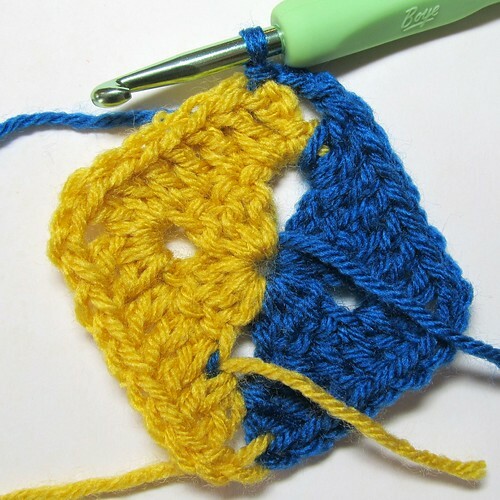 1 sc in each stitch around, and 3 sc in each of the four corners. I then recommend blocking your finished block to make it nice and square. You're done! Enjoy your hard work! Here's the back of the block, which I like as much or more than the front! The joins ended up looking a little cleaner. 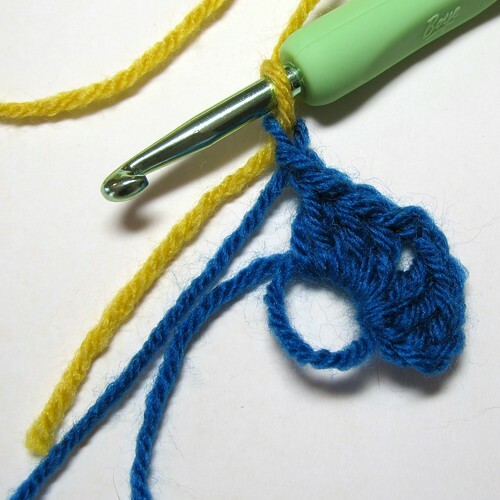 Maybe with a contrasting color for joining, whipstitching through both loops could make the hand stitching a neat design element! 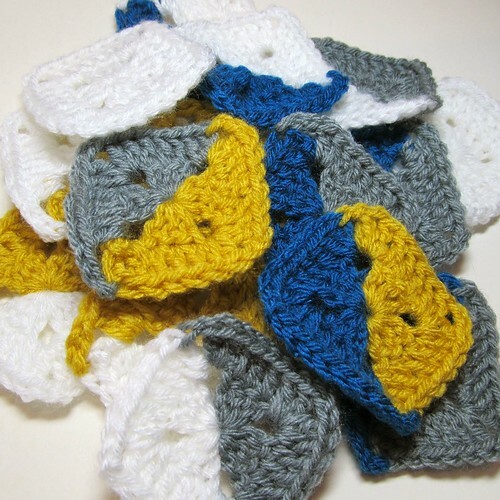 You could even take this idea further by making each square larger than just two rounds. 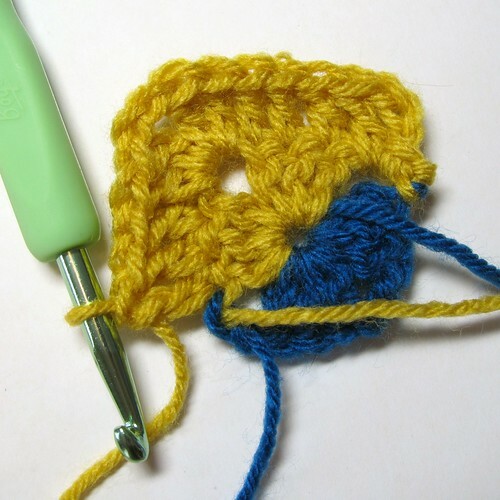 By following the same pattern, (1 dc in each stitch and [2 dc, ch 2, 2 dc] in each corner, you could make a square as many rounds as you'd like! 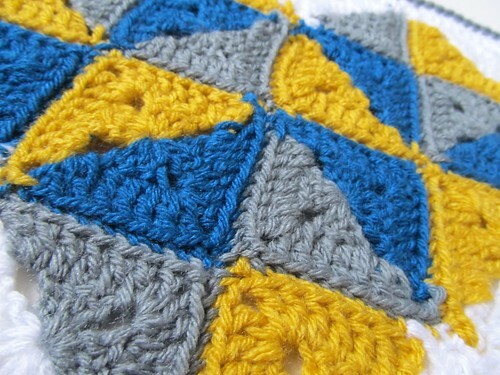 With bigger squares, you might be able to make an afghan with 16 squares! If you end up trying this block and run into any problems let me know!!! And I'll say it one more time: "I love you guys!!" This is simply fantastic Kate!!!! !Love it, love it, love it!!!!!!! 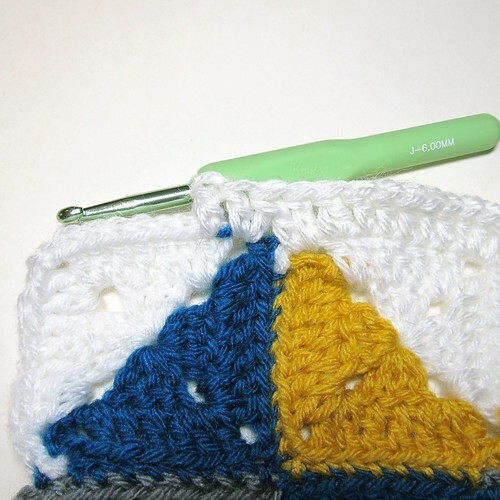 What a fun pattern made with your favourite triangles in time for Valentine's Day! 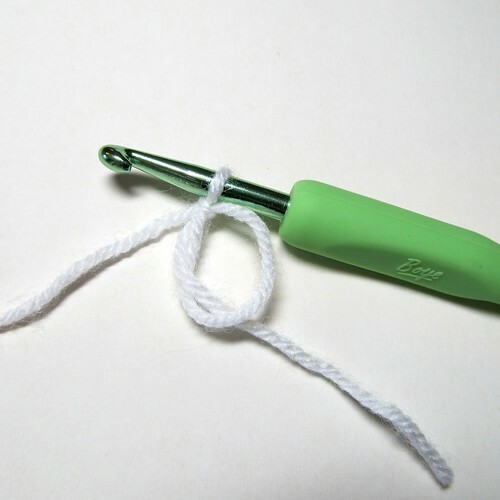 How nice to do a tutorial with your super new green-handled hook which doesn't have its size in millimetres! 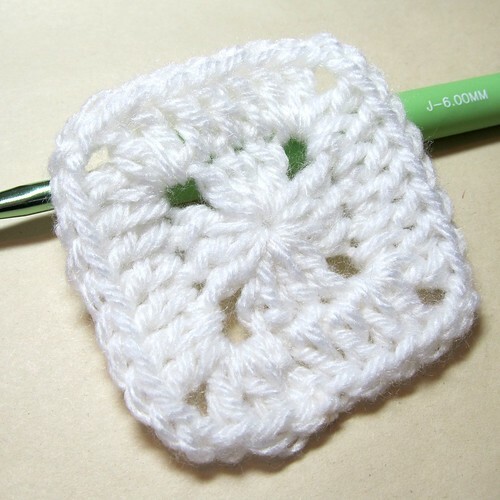 Have a great crochet weekend and look at winter from the inside! I must do this till 14th for my BigBrightBlanket! Im in love! This is gorgeous and I love your color choices. You really do nice tutorials. Great block. Great tutorial. Love those half square triangles. Thanks! If you try it and have any questions, let me know! 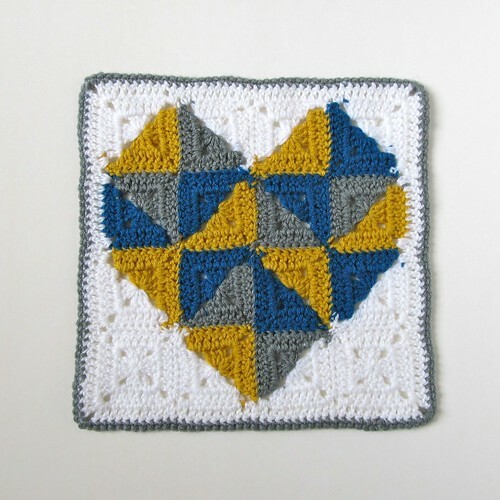 I'm imagining a sweet blanket made with these heart squares. hello kate, in my frenzy I forgot to actually comment! this is a really nice, signature piece that screams signed with an owl. i think i would know it was yours anywhere!! thank you sooo much for linking it to ffhf. Hola, KATE. Qué preciosidad. Me encanta!!! Gracias por el tutorial, por tu tiempo en prepararlo y ponerlo en tu blog. Me lo guardo en mi cocina. Thanks for sharing this technique with very detailed pics:) I saw a pillow using this and was searching for the way to do it:) Going to use black and white! Will start right away:) Thanks so much! Thank you so much and you're welcome!! Love you too Kate! Your work is awesome. Regards, Merry Christmas and a Happy New Year from Pakistan! 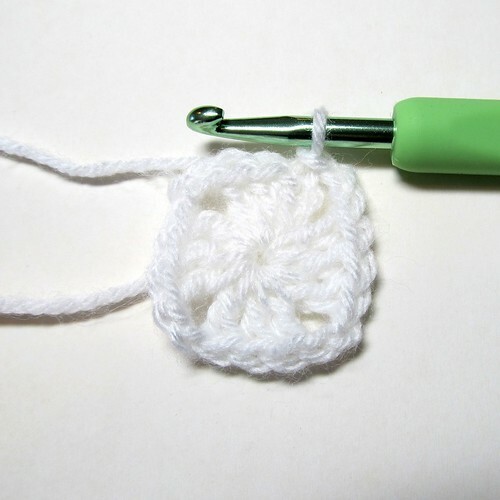 Hope you had a lovely New Year and happy crocheting!